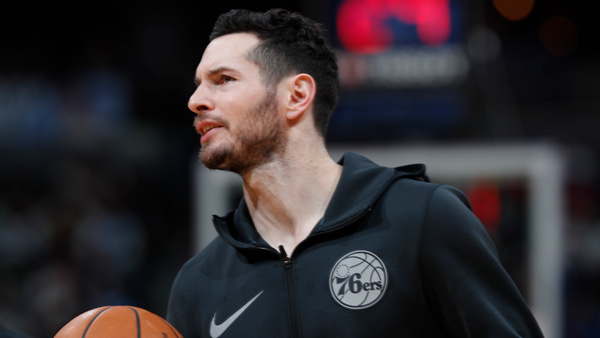 After drawing criticism for appearing to use a racial slur while wishing Chinese fans a happy new year in an online video that surfaced Sunday, Philadelphia 76ers guard JJ Redick offered an explanation and an apology in a statement posted to Twitter. The video, produced by Chinese media company Tencent, shows multiple NBA players and coaches wishing fans a happy Chinese New Year, which was Friday. In his appearance in the video, Redick appears to use a racial slur toward fans in China. Redick addressed the video Sunday in a tweet, saying that he was "tongue-tied" and that the "word I purportedly said is not in my vocabulary." He offered a more detailed explanation in a follow-up tweet later Sunday evening, writing that he intended to say "NBA Chinese fans" before changing course mid-sentence to "NBA fans in China." "It came out the wrong way," Redick said in the tweet. "At the time we recorded it, no one in the room ... heard the word that I purported to say. Had I known it sounded anything like that, I would have been mortified and recorded the greeting over again." The comment by Redick was included in a Tencent video called "30 NBA Players Wish Chinese Fans a Happy New Year." It aired at halftime in a broadcast of a game between the Golden State Warriors and the Portland Trailblazers on Feb. 14. ESPN has a business agreement with Tencent in which ESPN's content is localized and distributed on Tencent's digital platforms in China. ESPN did not shoot the Redick interview but did provide interviews for some of the players featured in the video, including former 76ers great Allen Iverson. Another version of the video does not include Redick, but the version posted Sunday on YouTube includes Redick's remarks. Redick, 33, is in his first season with the Sixers after spending the previous four seasons with the LA Clippers.